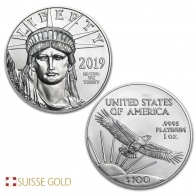 Brand new, 2019 coins in brilliant, uncirculated condition. 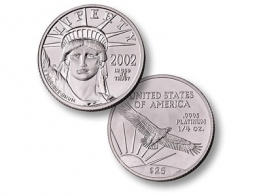 The American Platinum Eagle coin was first released in 1997 by the United States Mint. 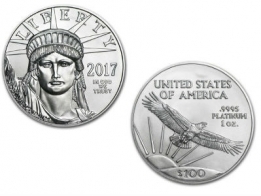 The coin is the only one produced by the US Mint in platinum, and comes in 1/10 ounce, 1/4 ounce, 1/2 ounce and 1 ounce sizes. The front of the American Platinum Eagle features the image of the Statue of Liberty, with the word "Liberty" engraved at the top. The reverse of the coin's design is updated each year. Many of the earlier coins feature images of Bald Eagle's across the different regions of America. Since 2009, the US Mint has introduced a 6-coin series of platinum Eagles, highlighting the Preamble to the United States Constitution. All American Platinum Eagle 1 Ounce coins have a face value of $100 USD. 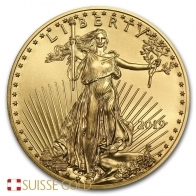 The US Mint produces the American Eagle coin series in gold and silver. The American Eagle coin series is the most popular precious metals coin available to bullion investors from the United States Mint. The United States Mint also produce the gold Buffalo coin and the gold St. Gauden coin, both of which are available in 1 Ounce size.